Welcome to another week of Wine Wednesday! This week, I'm going to talk about tasting wines. When tasting wines, it can be difficult to pinpoint exactly what flavors you are trying. At the same time, if two people try the same wine at the exact same time, they can come up with totally different flavors based on their taste buds and differences in what they've recently had to eat/drink. 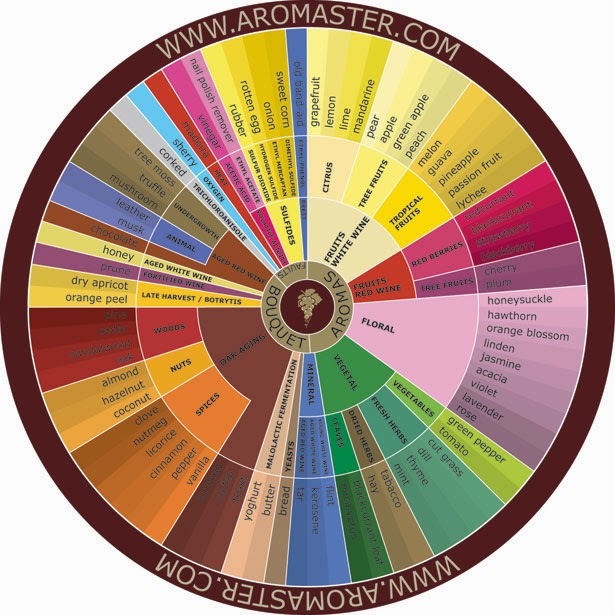 Because of this, today I'm going to share a great tool to help you describe wines as you taste them- a Wine Aroma Wheel! If you search online, you can certainly purchase one. However, I feel that there is no need to do this whatsoever. As you can see from the above wine aroma wheel, there are tons of different descriptors for wine. Start your description at the beginning of the circle with aromas: when you smell the wine, what do you get? Is it a fruity or floral scent? From there, work your way outwards in the circle. For example, perhaps you are smelling a fruity white wine. You can then determine if it is a citrusy scent, a tree fruit scent, or a tropical fruit. Once you have determined these initial scents and flavors, move on to more complicated areas (the bouquet or faults section). Reading the label of the wine, discover more flavors based off how the wine was aged (if at all) and other tastes. The 'faults' section is where you should look if you are not a fan of a wine because it has a fault with it- for example, a corked bottle will not taste well because of the presence of tricoloroanisole. Thats it for this weeks version of Wine Wednesday! As you are enjoying your next bottle of wine (perhaps tomorrow, for Thanksgiving!) what do you taste? What are the tastes from the best bottle of wine you've had? Cooks Is a most important part of your daily life. You are so brilliant. Long time I was looking for this relevant site. Thanks a lot for your nice shear.